Police have cracked down on flag-burning protesters gathered in Sydney for ‘Invasion Day’ – an event to protest Australia Day, which is celebrated on January 26. 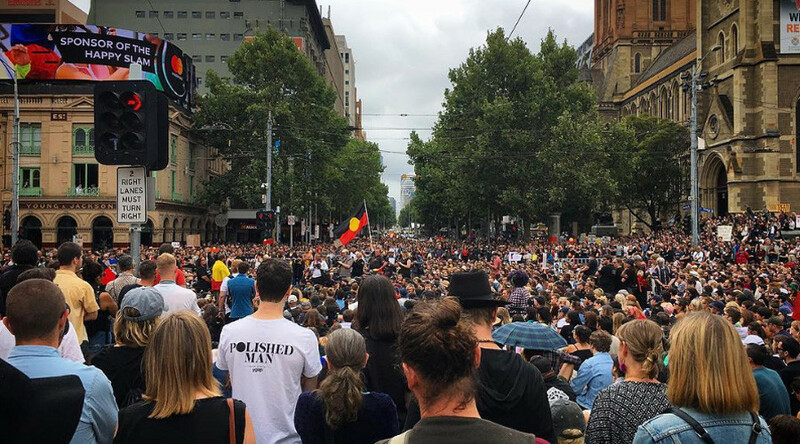 Thousands of people across Australia have joined indigenous people to protest the celebrations. The protester who initially tried to set the flag on fire, 20-year-old Indigenous Australian death metal singer Birrugan Dunn-Velasco, has been taken to the police station. A woman was injured in the protest and was taken to the hospital, ABC News reported. January 26 is considered a day of mourning by Aboriginal Australians. On that date in 1788, the first British ships arrived in New South Wales. “We have been mistreated, slaughtered and beaten down since the day, so don’t expect us to be happy little Aboriginals on that day,” Ken Canning, one of the rally’s organizers, told BuzzFeed. Canning told a crowd that “Australians have woken up” and now realize that Australia Day is a day of mourning for Aboriginal and Torres Strait Islander people. “That is not something to celebrate. That is not a day to throw a shrimp on the barbie. That is not a day to go out and get blind drunk and start throwing up all over the footpath,” he said, according to The Age media. “It was an invasion. And it’s still going on today,” he added. Indigenous elder Uncle Max Harrison, who came to a special smoking ceremony performed by Aboriginals in Sydney, expressed a milder stance, but also urged Australians to acknowledge what January 26 means for Aboriginals. “I just hope that the public could understand and look at our cultural day within this day that they call Australia Day,” he said, as cited by ABC News. Protests across the country have drawn thousands of people. The Melbourne protest is the biggest, with tens of thousands participating, witnesses say. In Canberra, hundreds of protesters marched from the Aboriginal tent embassy to the doors of Parliament House. The hashtags #ChangeTheDate, #InvasionDay, and #SurvivalDay have all been trending on social media. It seems, however, that most Australians want their national holiday to stay on the same date. A McNair yellowSquares national poll recently found that 68 percent of Australians felt positive about January 26, 19 percent were indifferent, while seven percent had mixed feelings, compared with the Aboriginal people, 31 percent of whom felt negative, with a 30 percent having mixed feelings. Asked if the date should be changed, 15 percent of Australians said ‘yes,’ compared to 54 percent of Aboriginals.